Gorgeous Townhome in Desirable Cherokee Crossing!! 3 Beds 2 Baths 1 Partial Bath 2,371 Sq. 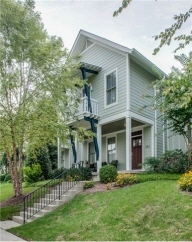 ft.
Sleek & stylish townhome in desirable Cherokee Crossing. Beautiful interior finishes, spacious floor plan w/9 ceilings, abundant storage & lots of natural light! Walk to fine dining & Greenway. First showing-- 8/3, 2 to 4 p.m.
Beautiful hardwood floors, large, open kitchen with granite countertops & backsplash, stainless steel appliances, 2-car garage, convenient location! !